James Bridie, pseudonym of Osborne Henry Mavor (1888-1951), was one of the leading British playwrights of his generation and the founder of the Citizens' Theatre, Glasgow. "The Citizens Theatre is probably more important as part of Britain's heritage than perhaps many imagined. It is Britain's oldest fully functioning professional theatre which retains the greater part of the historic auditorium and stage... The Citizens is thus a British national treasure." His desire for professional production of his work following the debut performance of his first play in 1928, led to many of his dramas in the 1930s and 1940s being presented first on the London West End stage. 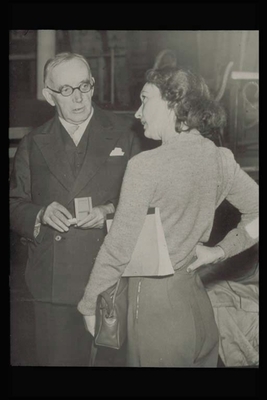 The first production at the Citizens' was Bridie's The Holy Isle and with its creation he increasingly wrote for the emergent Scottish theatre and produced some of his best work, such as The Forrigan Reel (1944), The Queen's Comedy (1950) and The Baikie Charivari (1952). Bridie's energy and vision is of paramount significance to contemporary Scottish theatre, not only in the creation of the Glasgow Citizens', but also in initiating the opportunity for professional training for Scottish actors, and promoting Scotland's cause in the post-war climate of state funding for the arts. Osborne Henry Mavor (1888-1951), was a University graduate and playwright who wrote under the pseudonym James Bridie. He was a mainstay of Glasgow University Union where he "invented" Daft Friday in 1905, and the Union's Bridie Library is named for him. 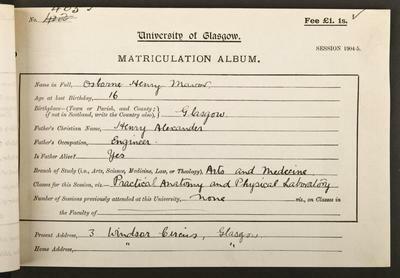 Born in Glasgow, Mavor studied Medicine at the University and graduated in 1913. He threw himself into the social life of Gilmorehill, notably as a contributor to Glasgow University Magazine and as a member of the University Union. 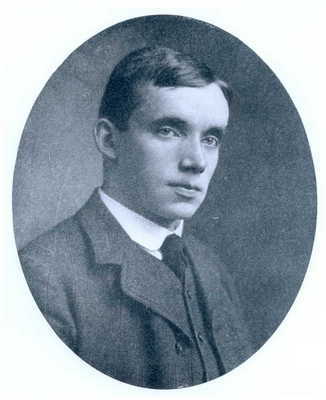 He became a firm friend of fellow-student Walter Elliott, a future Secretary of State for Scotland (the two men were co-authors of the Union song, Ygorra). He graduated in 1913. Bridie served in the First World War in the Royal Army Medical Corps and his later career included spells as a general practitioner, a consulting physician at the Victoria Infirmary and Professor of Medicine at the Anderson College of Medicine, before his increasing success as a dramatist led to his embracing that career full-time.. He was one of the leading British playwrights of his generation, the founder of the Citizens' Theatre, Glasgow, in 1943, and the first chairman of the Scottish Committee of the Council for the Encouragement of Music and the Arts established in 1942, (subsequently the Scottish Committee of the Arts Council of Great Britain). He was instrumental in the establishment of the College of Dramatic Art in 1950, now part of the Royal Scottish Academy of Music and Drama in Glasgow. Mavor wrote over 40 plays in his lifetime. His first play, 'The Sunlight Sonata', presented by the Scottish National Players, directed by Tyrone Guthrie in 1928, followed by 'The Switchback' (1929), and 'What It Is To Be Young' (1929). 'The Anatomist', produced in 1930, and based on the lives of nineteenth century vivisectionist Dr Robert Knox, and the body-snatchers Burke and Hare, was his first major success. This success continued throughout the 1930s and 40s with, amongst others, 'Jonah and the Whale' (1932), 'Mary Read' (1934) with Flora Robson and Robert Donat,'Susannah and the Elders' (1937), 'The King of Nowhere' (1938) with Laurence Olivier, 'Mr Bolfry' (1943) with Alastair Sim,, 'The Forrigan Reel' (1944), 'Dr Angelus' (19470), 'Daphne Laureola' (1949) with Edith Evans and Peter Finch and 'Mr Gillie' and 'The Queen's Comedy' (1950). In 1939 he was awarded an honorary LL.D from Glasgow University, and received his CBE in 1946. He died in Edinburgh in 1951. In 1955 Glasgow University Union purchased a bronze head of Mavor/Bridie by Benno Schotz. The Bridie Dinner, introduced that year, became a feature of Daft Friday at the Union. Findlay, Bill . 1988. A history of Scottish theatre. Edinburgh: Polygon. World Changing Project, "Creating the Glasgow Citizens' Theatre," in University of Glasgow World Changing (University of Glasgow, 2010); http://www.worldchanging.glasgow.ac.uk/article/?id=98 (accessed April 26, 2019). World Changing Project. "Creating the Glasgow Citizens' Theatre." In University of Glasgow World Changing. University of Glasgow, 2010. http://www.worldchanging.glasgow.ac.uk/article/?id=98 (accessed April 26, 2019). World Changing Project. "Creating the Glasgow Citizens' Theatre." University of Glasgow World Changing. University of Glasgow, 2010. 26 April 2019 <http://www.worldchanging.glasgow.ac.uk/article/?id=98>.